The day got off to an adventurous start. We nearly lost the first instrument we put in the water. Save for superb ship handling—typical aboard this vessel—and some ingenious deck work by crew and technicians—also typical—the thing would still be on the bottom. 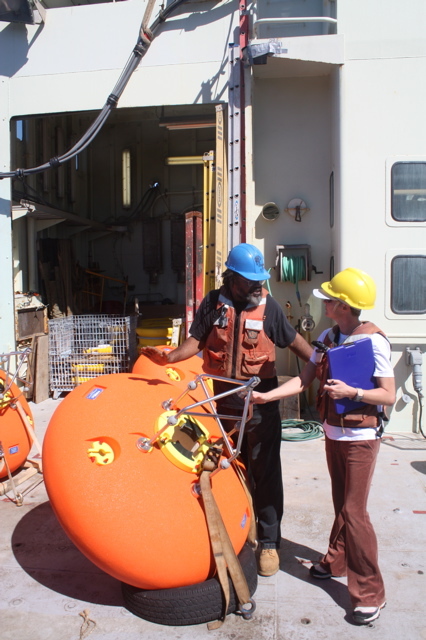 So this might be a good time to introduce that “flavor of oceanography,” its measuring devices and the vital cooperation between the ship handlers, the deck crew who actually put the instruments in the water, and the scientists, in this case Dr. Lisa, who decide where and why to place the instruments. We’ll be talking again about these matters as the cruise goes on. But for now let’s discuss just one of the things scientists seek to learn about current. How fast do they flow? The tricky aspect, however, is that the ocean doesn’t cooperate. Current velocity is not constant. You can’t just duck out here, dip your current meter in the water, pull it back aboard— “Ah, the Agulhas Current flows at four knots,” and then go home. No, the Agulhas, like its relatives around the world, changes speed week-to-week, maybe day to day. Maybe it’ll flow at the same speed for months, and then slow down (or accelerate) precipitously. 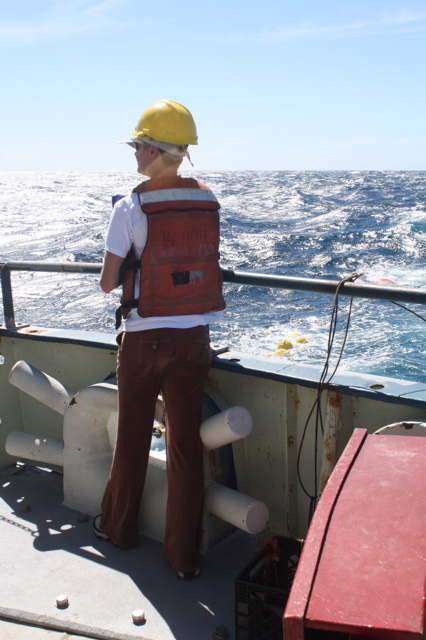 That’s why Dr. Lisa intends to leave her instruments in the water for a total of three years (changing the batteries and collecting the data every eighteen months) and why she named her project the Agulhas Current Timeseries. Also, the Agulhas is vast in all three dimensions. It averages about 100 kilometers wide; it’s thousands of meters deep on the seaward side; and it’s really fast, arguably the fastest in the world. And when the wind blows against it, the Agulhas stands right up and hammers the people trying to measure it. So how do you understand a thing like that? Broadly, there are two ways to measure a current’s velocity. You can set an object adrift in the current and somehow follow its course and speed. In technical lingo, this is called the Lagrangian, or float method. By the other means, the Eulerian method, you fix your current meter in the water and measure the flow of water past that point. It’s sort of like cinematography. You can follow the action with the camera, or let the action flow in front of it. Dr. Lisa is using the latter method. 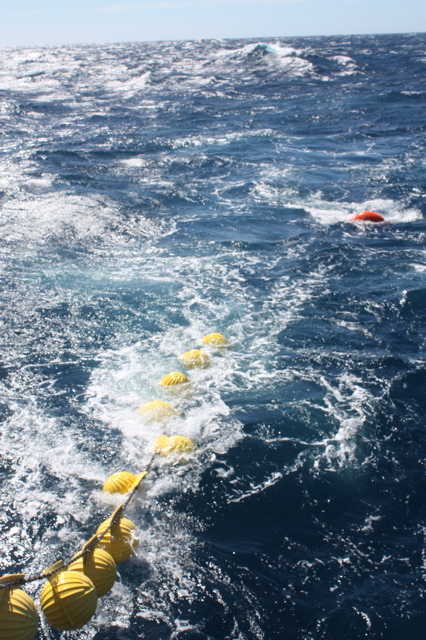 If a single current meter can measure the current’s velocity at a single point, then an array of them strung on a mooring cable anchored to the bottom and held vertically by a flotation device near the surface can provide a full-depth profile of the current’s velocity at that particular point. That’s still only one point, not good enough. But a string of moorings festooned with current meters set astride the current can deliver extensive knowledge about that section of the current both horizontally and vertically. That’s what this cruise is about. That’s the concept, but it’s easier said than done. 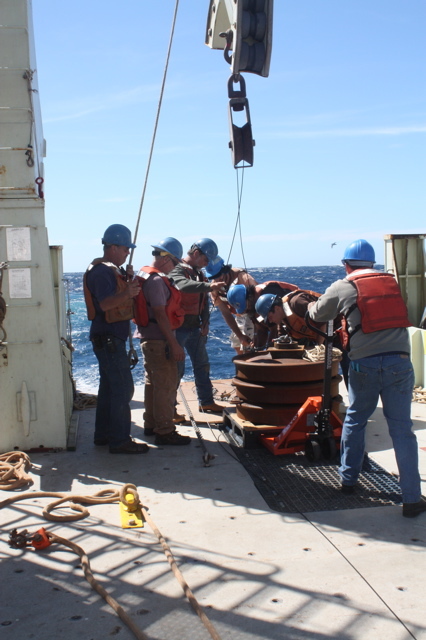 Laying a single mooring requires the concerted effort of about ten people on deck and at least one person on the bridge carefully maneuvers the ship while mooring is paid out. 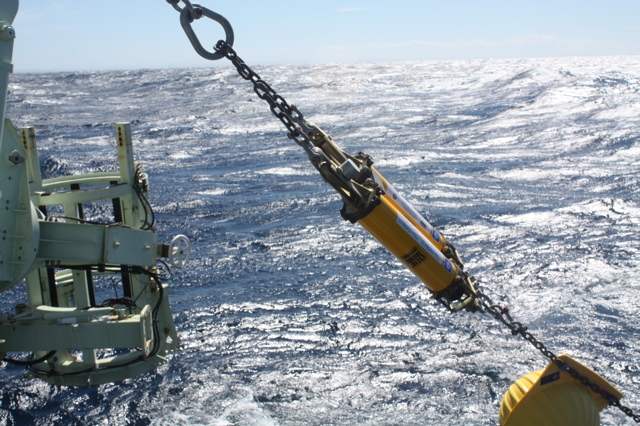 Oceanography is a unique combination of sophisticated science, fine-tolerance measurements, and downright heavy industry. The mooring: From bottom to top, you have a stack of railroad-car wheels acting as an anchor. Then you need serious floats to keep the mooring wire vertical against the current that wants to blow it down. Floats, glass spheres in heavy plastic covers (called “hard hats”), are shackled to the wire. 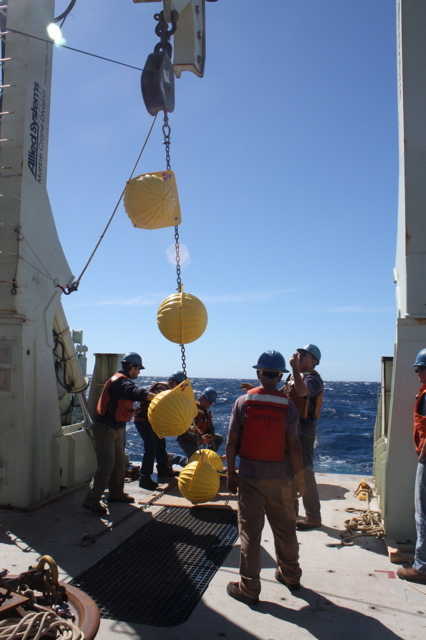 You need a top float as well, in this case an elliptical ball delivering about 2,500 pounds of buoyancy. This is all to supply the stable structure on which to hang your instruments. But when the deck guys deploy the mooring, they do it from top to bottom, first the big top float goes over the side, then with the floats streaming astern, they shackle on each instrument, a bunch of hard hats, all very heavy, until they reach the railroad wheels and splash it over the side. Deploying one mooring takes all day. Then there’s one other specialized wrinkle—the acoustic release. You can’t let the topmost float bob on the surface for eighteen months where it could be run down by ships, caught in fishing nets, or torn lose by waves. No, it must remain 200-300 meters below the surface. So how do you retrieve the mooring? That’s where the acoustic release comes into play. The release consists of a cylinder packed with electronics and a set of steel jaws on the bottom end. 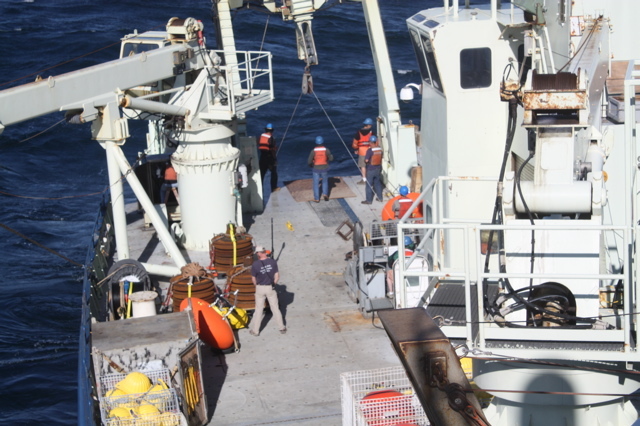 When we return to retrieve the instruments to collect the data they’ve been storing, the two highly skilled mooring technicians will “talk” to the release in an acoustic code from a specialized black box, asking if it’s still there and ready to work. The release replies in the same language, “Yes, ready for orders.” Then they will tell it to open its jaws, and the entire mooring floats to surface where it can be winched back aboard ship. But what if it doesn’t release or doesn’t even answer? After all, it will have been sitting in the deep ocean—some of Lisa’s offshore moorings are 4,000 meters long—for eighteen months. 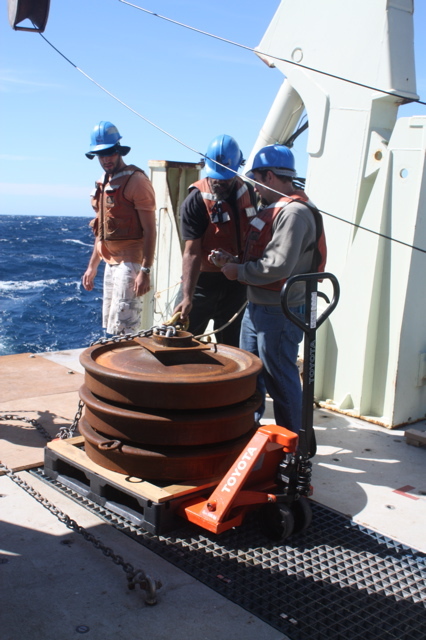 Since the life of the mooring, a lot of money—Knorr costs about $45,000 a day to operate—and the success of the scientific experiment depend on this device, moorings are usually equipped with a redundant release to increase the odds of retrieval. 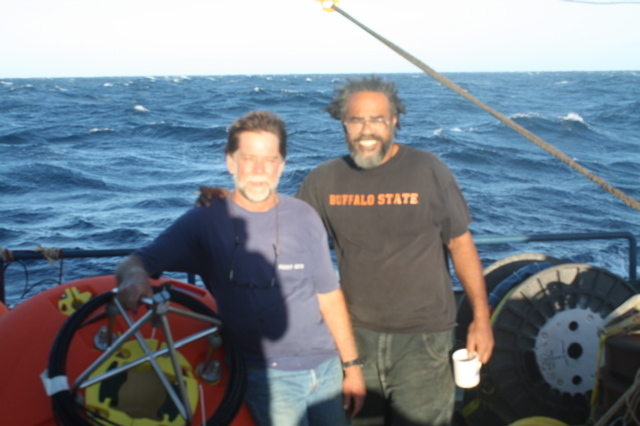 But all oceanographers recognize that when they sink their high-tech instruments, they no longer own them. The ocean does. It may or may not give them back depending on multiple factors all beyond any human control. This morning, they dropped a pressure gage (to measure the tide range) on the bottom, but it landed on its side, so they triggered the release to get it back and try again. But the four-knot current dragged the float under. Gone, the first instrument of the cruise, a bad omen. But, no, Captain Kent worked out a shrewd plan to put the ship in position; the deck guys rigged a grappling hook, and after some adroit ship handling by Second Mate Derek, they snagged it on the first pass. Speaking for myself, it’s always pleasure to sail on Knorr with professionals of this quality. Trouble is for now, the wind’s blowing against the current, and as if annoyed by that, the Agulhas is throwing up some nasty, short seas. The new motion is getting to me as the computer screen bounces around in an unruly manner. So I’d better sign off. Seasickness—another aspect to the brute difficulty of measuring the ocean. Anyway, talk with you tomorrow.